OK – I can see Christmas Who remaining as divisive as ever. Since the Sycarax, murderous Christmas trees and oompah Santa-masked mercenaries took to the screen in the Tennent-period, has anything divided Who fans more? OK – Catherine Tate, perhaps. And Clara. Indeed, I sense Clara will have much to do with the division this time. Some, like my wife, expected something of this Christmas episode that Moffat didn’t deliver. They expected Clara to leave, to walk away from the TARDIS once and for all. She had, at the end of the final episode of the series, spun a tale to the Doctor that she was happy with Danny Pink and he had nothing to worry about. He did the same in the respect of finding the location of Gallifrey. Christmas could have been the final final farewell. You should have heard my wife’s words of exasperation, like she had taken Moffat’s solemn promise and he had broken his vow. I don’t recall said words exchanged. I remember Canada acting all coy when he appeared on The One Show. Perhaps Moffat also didn’t help his cause when he named this episode Last Christmas and provided the Act 3 twist that he did. Naughty man. For my part, I would have missed Clara and I’m happy she will continue the journey. For all we know, she might pull a Bonnie Langford and only linger for a short while before handing over to someone else. It doesn’t make sense to spoil Christmas with something as wrenching as a departure. Christmas almost needs to be the episode you could miss altogether and not spoil the continuity of the show. Almost. Indeed, after the Tennent-period that pretty much has become the case. I liked the episode. 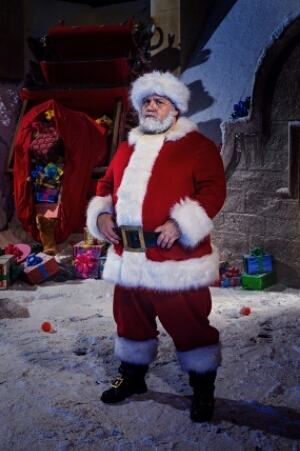 I liked Nick Frost as Santa, and those cheeky elves. I enjoyed the plot and the threat. A lot of the knowing humour hit spot on for me, making me chuckle – like Santa explaining he can carry all the presents for the children of the world because his sleigh is bigger on the inside. In all likelihood I will give the episode further consideration and come back to it. For me, I found a lot to enjoy here and felt far more satisfied than I have with some Christmas episodes. It felt like a good episode with a dose of Christmas, rather than a dose of Christmas with a hint of Who. This entry was posted in Current Doctor, Review and tagged Christmas episode, Clara Oswald, Last Christmas, Nick Frost, Peter Capaldi on December 26, 2014 by Paul B.